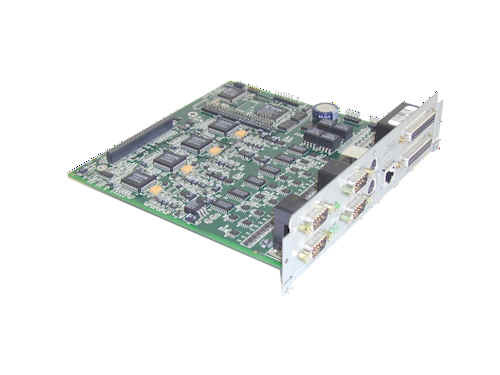 The SAP-104 audio store and forward expansion card, for the DCR-974 receiver, is designed to provide for the real-time reception of high quality MPEG encoded audio. The card will also provide a store and forward feature to allow audio files, which have been locally stored as files in the receiver, to be played back on command. The SAP-104 supports the standard MPEG 2, Layer II audio format. Standard data rates and sample rates are supported as well as the standard modes including mono, dual mono, stereo and joint stereo. Standard MPEG file formats are supported for the store and forward function. The SAP-104 will decode up to four audio streams, each available as an analog or an optional AES3 (AES/EBU) output. Real time audio or IP multicast files can be stored in the receiver for delayed play back. Files are stored in the receiver on an optional hard disk drive or an optional non-volatile flash drive. The recorded files may be triggered to play by local command or through an optional network automation system. An external computer running web browser software can also accomplish local control of the play function. Control of local automation systems is provided by switch closures controlled from the network headend. In order to support an expandable number of switch closures an external module is provided, which may be mounted directly on the output connector of the SAP-104, or mounted remotely using an extension cable. Downloadable embedded controller code No software exists on the SAP-104 card. All code associated with the operation of this card resides on the main PC board. New versions of this code can be changed or upgraded through the NCS control channel in time slot 1 of the aggregate stream. System configuration control System configuration is controlled via an 8 kbps embedded NCS control channel in time slot 0 of the aggregate stream. Of these 8 kbps, 4 kbps is used for synchronization and 4 kbps is used for the NCS data channel. Real-time audio control An additional control channel is embedded into time slot 0 of the TDM aggregate to provide for real-time control of the audio including switching, storage, and playback functions. Local configuration control Local control of expansion card configuration is available via the front panel keypad and display on the DCR-974 receiver. Local control of the audio playback functions The audio playback function is controlled by an Ethernet connection between a local computer and the DCR974 receiver or by external switch closure. Remote control of the audio playback functions The operation of the audio playback function may also be implemented via the real-time audio control channel. This operation is controlled by an optional software system located at the network headend. Number of audio decoders 4 independent decoders, A, B, C and D.
Cross fade function B analog output can crossfade between A and B streams. D analog outputs will crossfade between C and D streams. Audio output source selection Audio output selection is achieved by mapping an output port to a chosen audio stream. Outputs can be selected from real time audio streams, or a previously stored audio file. Selection is under the control of optional software at the headend, or can also be made locally from the front panel. Cross fade of audio sources to output ports Crossfading between two audio sources on the analog B and D outputs is under control of the optional software system located at the network head end. 8 isolated closure inputs that will command an audio file to be played from the stored audio file list. Optional closure module expansion A second connector is supplied which will accept an optional second module which will provide a further 8 inputs and 8 outputs. Audio sources for decoding Audio decoders can decode audio from incoming live streams or from previously stored audio files. 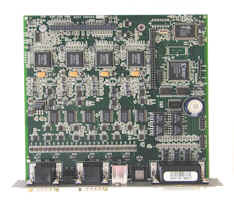 Storage media Storage drives mounted in DCR-974 chassis. 2.5" IDE hard drive. Optional solid state IDE flash drive. Packaging The SAP-104 is a double height plug-in expansion card for the DCR-974 DigiCeiver.